Mother’s Day falls on May 13th this year, which also happens to be my mother’s birthday. So I thought it only fitting to post this recipe for my mother, Susanna, for Mother’s Day, and her birthday (goes along with this two week virtual birthday party I’m throwing here on my site). Here is a picture of my mother, me, my brothers Dylan and Jude, and my cousin Ila (mother of the little blond girl you see eating cupcakes in the sidebar to your right). I’m the one in the strawberry hat, obviously. Strawberries hold a very dear place in our family. My grandmother Catherene had a strawberry patch. Really, more of a strawberry field. We all lived together; grandparents and sometimes cousin, and I have very fond memories of picking strawberries with my family, to concoct into an endless array of delicious creations. The strawberry patch was a magical place, where I’d sit for hours, picking, and of course eating one berry for every one that made it whole into the basket. Our strawberry patch was like something out of a Beatrix Potter book, complete with bunnies hiding under the large awning of the rhubarb plants that surrounded the field. We made strawberry rhubarb pie, strawberry ice cream (see birthday recipes), strawberry compote, strawberry jam, strawberries with mint, Marsala, lime, and honey, strawberry shortcake, strawberry pancakes, and I remember many an afternoon, sitting with my mother on the screen porch, paring strawberries to eat sprinkled with just a little sugar. We ate strawberries in a myriad of ways — but I don’t think we ever made strawberry cake or cupcakes. I can’t imagine why not. Strawberry cupcakes are to-die-for. The fresh strawberry puree in the frosting takes buttercream to a whole new level. This frosting, strait from the berry patch is bursting with sweet berry flavor. So mom, these Allergy-Free Strawberry Cupcakes are for you. I’ve found a new way to feature our favorite family fruit. And I’ve made them safe for as many people as possible. Because I think just about everybody loves a strawberry. With strawberry season in full swing, local farmer’s markets are overflowing with these sweet little beauties. Take advantage of their cheaper price tag, and bake strawberries into all your favorite treats. 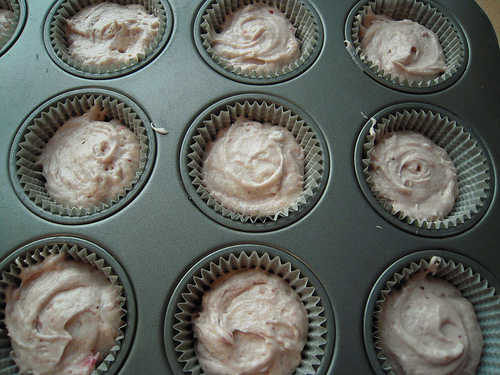 Brimming with vitamin C and fiber, strawberries make these lovely cupcakes almost a health food! So pretty in pink, these gems are great for Mother’s Day, birthdays, class parties, or an afternoon tea. And don’t forget your Memorial Day barbecue, they are perfect for that too. Don’t they look like they must be bad for you? Nope, 100% natural, gluten-free, vegan, and free of all top food allergens. Now, that’s a berry special treat. 1. Preheat oven to 350°F. Line a cupcake pan with 12 liners. 2. 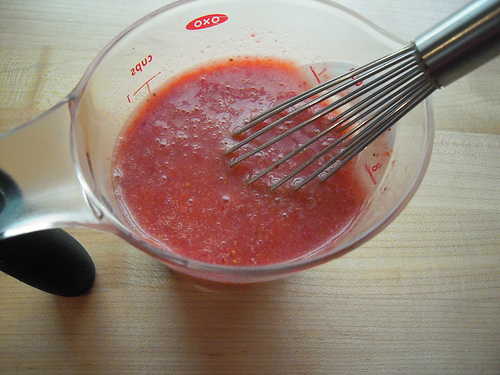 Puree strawberries in blender, until reduced to 1/2 cup liquid. Add a few more strawberries if necessary. 3. Combine 1/2 cup strawberry puree with 1/4 cup rice milk, lemon juice, and vanilla extract. Set aside. 4. Measure out flour mix by spooning flour into a dry measuring cup, then leveling it off with a straightedge, or the back of a knife. (Do not scoop the flour directly with the measuring cup or you’ll wind up with too much flour for the recipe). Combine flour mix with xanthan gum, baking powder, baking soda, and salt. Whisk well. Set aside. 5. In the bowl of a stand mixer fitted with the paddle attachment, combine vegetable shortening and granulated sugar. Mix on medium speed 2 minutes. 6. Add egg replacer to bowl of stand mixer. Mix on medium speed 1 minute more. 7. Using a sifter, sift in the flour mixture in three batches, alternating with strawberry mixture, beginning and ending with flour mixture, and mixing until combined, about 30 seconds. Once batter is smooth, spoon about 1/4 cup batter into each liner, filling the liners about three-quarters full. Do not overfill the liners, or they will rise too high. 9. Remove from oven and transfer cupcakes to a cooling rack to let cool completely before frosting. Either pipe frosting or use a frosting spatula to spread it. Top each cupcake with a strawberry. 1. Puree strawberries in blender. Set aside. 2. In the bowl of a stand mixer fitted with the paddle attachment, cream shortening and pinch of salt on medium speed, about 2 minutes. 3. Add confectioners sugar in three batches, beating after each addition. 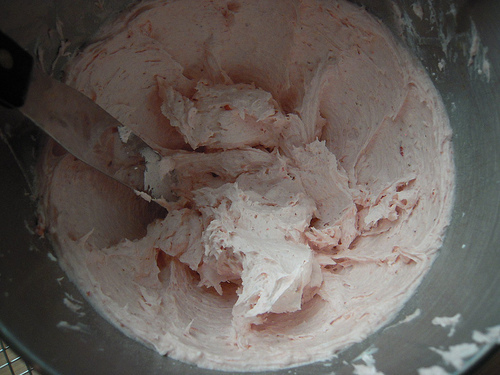 Add 3 Tablespoons of the strawberry puree, and vanilla extract and beat until smooth and fluffy, about 3 minutes. I’m so happy you liked them! They are one of our favorites too! What a beautiful post! Your mother sounds very special. Thank you for sharing you with us. You’re too cute in that strawberry hat! We have a ton of local organic u-pick farms all over here in Northern California. And there’s a great organic strawberry farm just up the road. We are taking the kids this weekend. Can’t wait! Thanks Cybele, and have a great rest of your week. Enjoy your picking! Share what you make with us! I love this idea of of fresh strawberries in baked form….thank you for inspiring me Cybel…you always do! Hi Tessa, I hope you like these. They are so fresh and flavorful. Let me know what you come up with. I have a question, and I think you are the only person who can answer it… I want to make these, but the person I want to bake them for is allergic to corn. Do you have a brand of baking powder that you like that is also corn free? You can use Hain, it’s corn-free. Enjoy! I just wanted to know, do you have a recipe for gluten/dairy free hot pockets? I’ve asked you before and you said maybe you would come up with it. Thanks, it would be great!! Just a note to let you know I shared your awesome recipe on my monthly recipe round-up: Mother’s Day Edition. If you get a chance, come on over and check out the other inspiring recipes from sweet indulgence to homemade gifts. Thanks so much, Amber! Will do! Hi Cybele! Yummy! Think I’ll make these for myself for mother’s day! LOL!!! One quick question on a recipe from the Allergen Baker’s handbook… it’s the bread recipe that is supposed to use GF beer, but it says it can use club soda as well… I couldn’t find club soda at TJ’s yesterday, so I bought sparkling water….. would that work or is there not enough carbonation for the bread to rise? Thanks. hm, not sure where you got that info. You need to use beer because that’s what contains the wheat that makes the bread rise. Sorry! Sparkling water or club soda won’t work. Thanks! I just realized that it was a different recipe from a different book… starting to lose it a little bit. 🙂 Thanks for taking the time to reply though. These look amazing! In my fridge I have some strawberries that are a little past perfect just begging to be turned into something yummy like this! I have made these now several times, and will be making them again this weekend. People can’t believe they are allergen free! I love that i can make something that everyone can enjoy whether they are GF, vegan or none of the above! Can you make the strawberry cupcakes recipe into a 8 inch cake instead? Thanks for all of your recipes… I have all of your books! Without you I would be lost! Absolutely. This is something I’ve been meaning to do. Maybe this weekend? 🙂 I think one needs to adjust the proportions. Another out of the park recipe! HUGE hit at my daughter’s Minnie mouse themed very pink 2nd birthday! Thank you! I made this for my son’s 2nd birthday. Turned out great. There was too much frosting, but we’re not complaining! Yay!! Happy Late bday to your son!